This is a dish that my aunt Wafa taught me when I spent a week at her and my Uncle Ashfaq’s–long time ago when I was in Yemen. I loved it so much, and I have been making it every since. I always make them together–although you an make each on its own. My aunt made the rice in a pressure cooker, and I have noticed that it is definitely tastier if you do so. But you can make in a regular pot. Place pot under medium heat , add the oil, onions and green chilly pepper and let brown. Then add the red chilly sauce, cumin and coriander and let cook for about 2 minutes. Then add the tomatoes and salt and cook until the tomatoes soften. Then add the tomato paste and let cook for one minute. You will end up with this red paste. Add the rice and mix well, and then cover entirely with hot boiling water, cover and leave on low until rice is cooked. Optional–toss with fresh chopped cilantro. As for the chicken, very easy. In a covered pot, place all the ingredients for the curry chicken. Mix well, cover, and leave on medium heat for an hour or so–until the potatoes are cooked through and the chicken pulls from the bone, and the oil rises to the surface. Garnish with finely chopped cilantro. Serve with the rice above, or with bread. May Allah (swt) grant my aunt Wafa Jannah for teaching me such a delicious and quick meal. 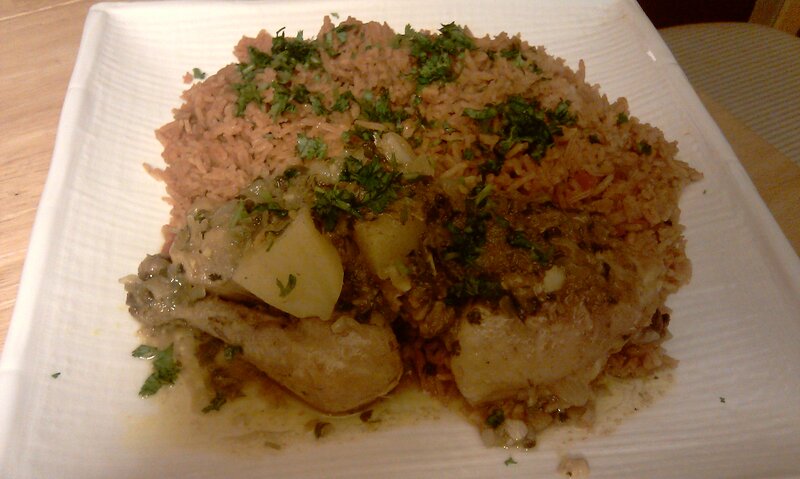 Hi dr lamya i tried this recipe out for my husband mashalla i was really impressed it was really tasty. thanks for your recipes but can u put more recipes up please i just love to cook and mashalla i just love ur recipes thank you. I just sent you an email. I asked my husband and he told me that Moodiyyah is in Abyan. Barak Allahu Feekee and Wa Iyakum. Jazakallahkhair ya akhti habeebati. Really appreciated it. Barakallahfeekee, Wa Iyaakum. May Allah Ta’aalah reward you for this wonderful effort Mashallah. Wa Iyakum Sister Ruwaydah. Wa Feekee Habeebtee. Salam, dr lamya thank you for replying im not looking for anything in particular but seeing as ramadhan is coming up it will be nice to have some more dessert recipes and snacks thank you. Insha Allah I will post if i make some more habeebtee insha Allah. You’re very welcome. saalam, dr Lamya, hope you and your family are all well. do you add water to the chicken when you put all the ingredients in the pot? if so how much? thank you dear sister, i make nearly every day one of your many wonderful recipes. Allah bless you always. from Ziads wife. Allah bless you too sweetheart.